The first book on Léonie Gilmour, including her biography, letters, and all of her important published writings. Leonie Gilmour: When East Weds West tells the story of Léonie Gilmour (1873-1933)—partner of Japanese writer Yone Noguchi, mother of artist Isamu Noguchi and dancer Ailes Gilmour—a woman who chose a unique path to achieving her personal and professional goals, rising above poverty, racism and an ill-fated marriage to take up the challenge of raising two mixed-race children alone in distant Japan. Bringing together extensive research and lively storytelling, Leonie Gilmour: When East Weds West is the first complete portrait of the unique, pioneering American educator, editor and writer whose story inspired Hisako Matsui's acclaimed film Leonie, starring Emily Mortimer and Shido Nakamura. 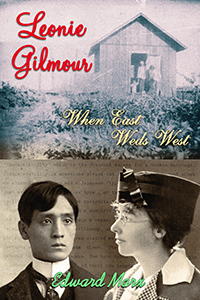 Gilmour's fascinating tale is told here through her own writings and those of her associates, including rare and unpublished stories and intimate correspondence, along with a detailed biographical account by Edward Marx. Edward Marx is the author of numerous books and articles on the Noguchi family. He is currently professor of British and American Language and Culture at Ehime University in Matsuyama. Botchan Books is a division of Botchan Media.